Clean and wash Spinach leaves. Add 1/2 cup water and boil till they are soft. Cool and grind it in a mixer. Chop tomatoes, green chillies & ginger. Blend them in a blender. Heat ghee in a pan. Fry cumin seeds, add garam masala, tomato paste & salt. Cook it till masala is done. Pour in spinach paste and cook for 5 mins on low flame. 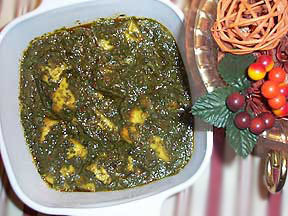 Cut paneer in to small cubes and add to the spinach mixture. Cook for 5 more minutes.